Tackling the huge amounts of data generated by the Internet of Things (IoT) is leading to two interesting new hardware and software architectures alongside the current focus on machine learning and artificial intelligence. HP Enterprise has developed a new technique for handling large amounts of information in the data centre. 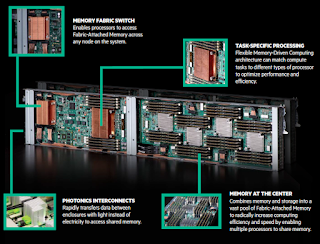 The Memory-Driven architecture makes all the data easily available, and HPE has developed a system with 160TBytes of such storage. A key feature of the new architecture is direct photonic interconnections between each block of memory. The direct fibre connections from every memory block to every other block means the processor can access data anywhere in memory at effectively the same speed, which allows the system to perform calculations far more rapidly. This also allows specialised processors such as AI accelerators to access the same shared pool of data, such as information from the Internet of Things. “We’re all intrigued by the potential of data to change our lives, but just as we’re ready to take advantage of it, the technologies that got us this far are petering out,” said Sharad Singhal, director of software and applications for HPE’s Machine project. The best way to handle such data, says Singhal, is to put the whole graph in memory at once, and make all physical blocks of memory equally quick to access. Memory-Driven Computing makes that much more feasible. 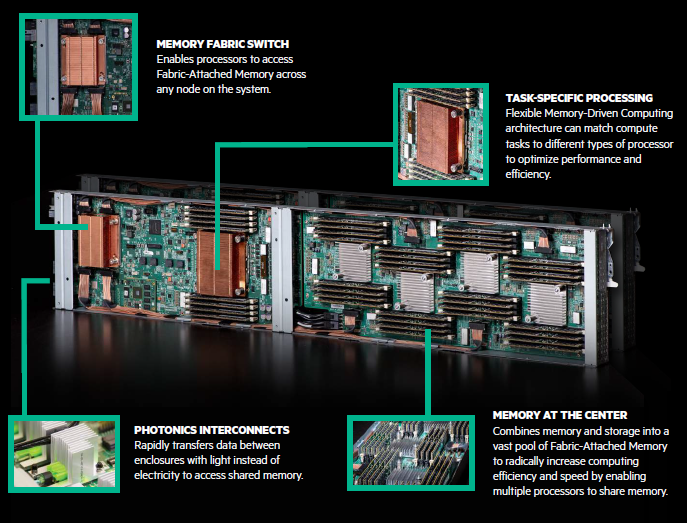 HPE has now launched a system with 160Tbytes of this shared memory, allowing much more flexible and efficient processing of large sets of data. Researchers at the University of Michigan have developed open source software that provides and efficient way to share server memory in order to speed up performance of existing hardware in data centres to address this same problem. The Infiniswap software boosts Remote Direct Memory Access network performance by 47% in a cluster without having to change the hardwares. "Infiniswap is the first system to scalably implement cluster-wide 'memory disaggregation,' whereby the memory of all the servers in a computing cluster is transparently exposed as a single memory pool to all the applications in the cluster," said Infiniswap project leader Mosharaf Chowdhury, U-M assistant professor of computer science and engineering. "Memory disaggregation is considered a crown jewel in large scale computing because of memory scarcity in modern clusters." The software lets servers instantly borrow memory from other servers in the cluster when they run out, instead of writing to slower storage media such as disks. To avoid the memory bottleneck, the Michigan team designed a fully decentralized structure. With no centralized entity keeping track of the memory status of all the servers, it doesn't matter how large the computer cluster is. Additionally, Infiniswap does not require designing any new hardware or making modifications to existing applications. The research team tested Infiniswap on a 32-machine RDMA cluster with workloads from data-intensive applications that ranged from in-memory databases such as VoltDB and Memcached to popular big data software Apache Spark, PowerGraph and GraphX. They found that Infiniswap improves by an order of magnitude both "throughput"—the number of operations performed per second—and "tail latency"—the speed of the slowest operation. Throughput rates improved between 4 and 16 times with Infiniswap, and tail latency by a factor of 61. "The idea of borrowing memory over the network if your disk is slow has been around since the 1990s, but network connections haven't been fast enough," Chowdhury said. "Now, we have reached the point where most data centres are deploying low-latency RDMA networks of the type previously only available in supercomputing environments."